I was trolling the aisles of Trader Joe’s, looking for inspiration for dinner, when I noticed the Sample Girl handing out samples. “How’s your day going?” she asked — which is what the Sample Girl always asks. “Chicken pie,” she said, handing me a tiny paper cup filled with a single bite of chicken pie, flaky puff pastry crust on top. And I had my inspiration. 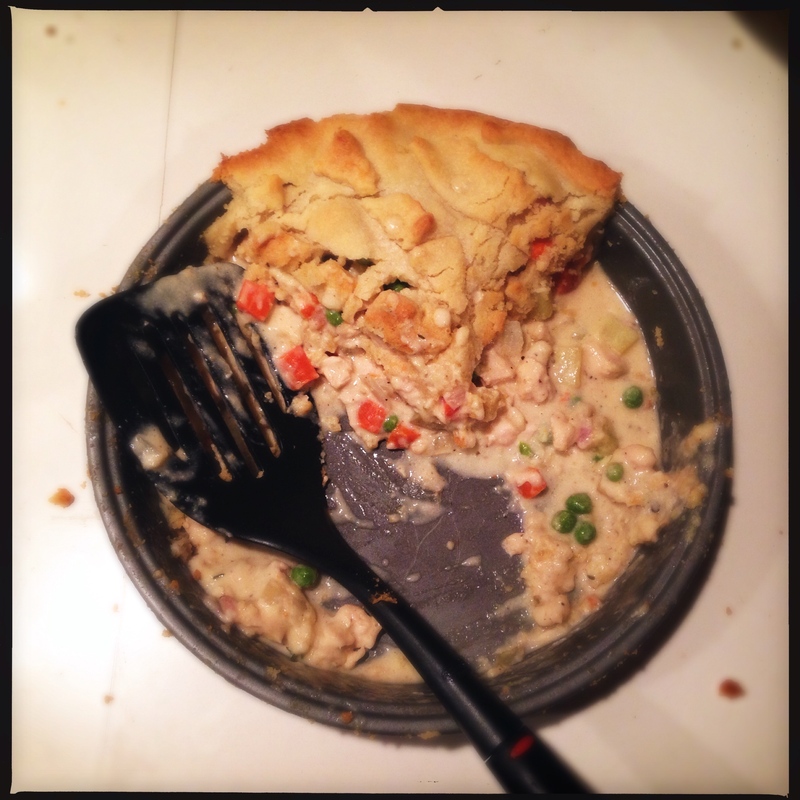 But rather than going for the pre-made stuff, I grabbed a chicken and some pie crust, and I was in business. “Find everything you were looking for?” said the Check Out Guy — which is what the Check Out Guy always says. “Found things I didn’t even know I was looking for,” I said. My usual reply. Back in my kitchen, I carved up the chicken — froze the legs, put the wings in the fridge for a snack later in the week, dunked the carcass into a pot of boiling water for stock. The breasts I seasoned and then flash fried in a hot pan to crisp up the skin, the first step on the Road to Chicken Pie Nirvana. My friend, Shirley, has tastefully good timing. I ran into her at the preschool, she told me her husband Nat was in Nicaragua surfing, and she seemed to be hinting at something. No, it was not a romantic rendezvous she was after — I knew what was on her mind. “Do you and the boys want to come for dinner?” I said. 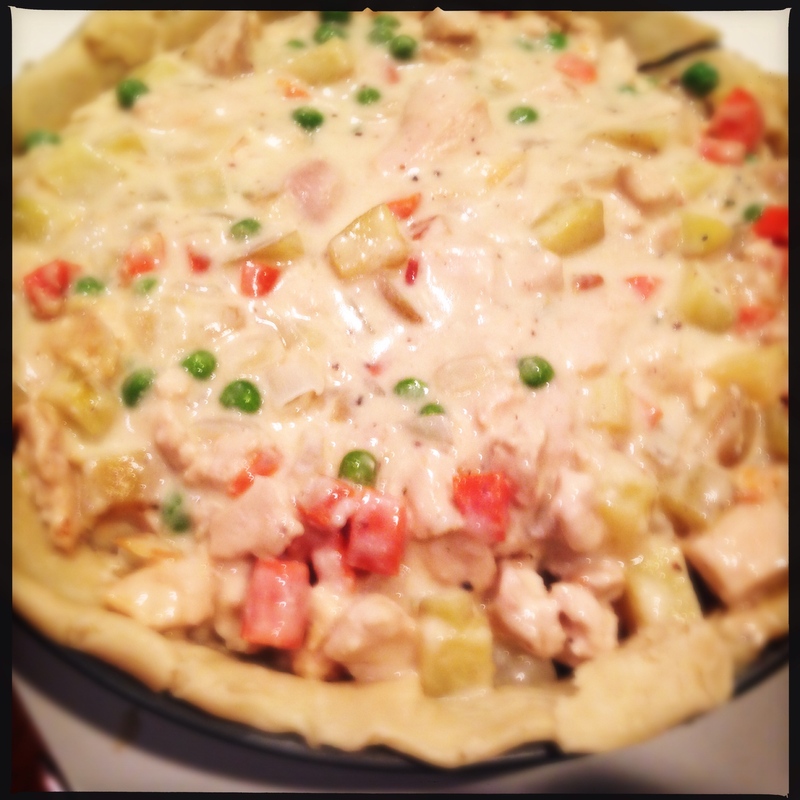 I’ve made chicken pies before — chicken pot pies, chicken hand pies, chicken empañadas — but this was something special. “You’re going to put that on your blog, aren’t you? ?” Shirley demanded. And so I am! The two moments of genius in the case of this particular pie were the addition of truffle salt (I chose to suggest truffle oil in my recipe below, since more people tend to have that — but you can use either) and swiss cheese, which when added to the béchamel-like sauce of the filling created a beautiful mac-and-cheese silkiness. 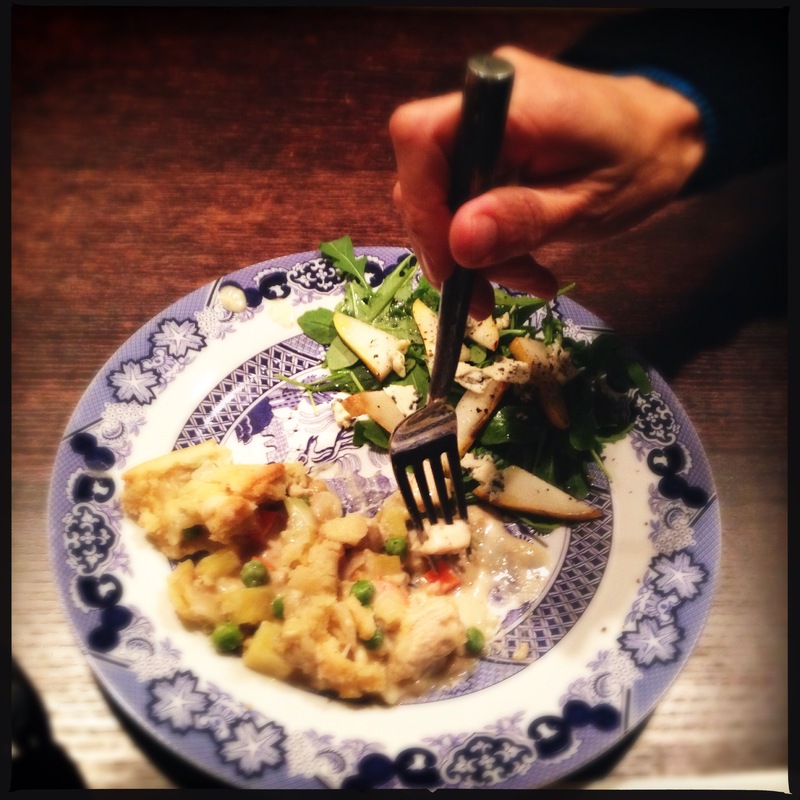 With the exception of 4-year-old Imogen who currently hates pretty much everything but raw fish (“Ewww… that’s disgusting!” she said when I presented her plate of pie before her), the pie was a big success. Formerly picky eater Flynn gobbled down every last bit — even the peas! Shirley’s pumpkin pie, made with real pumpkins and served with a fresh, lightly sweet whipped cream, was a joyful finish — and I don’t even like pumpkin pie. No one had pie fatigue, and we even ate more pie for lunch the next day! Here’s your chicken recipe. You’ll have to ask Shirley nicely for hers. Enjoy! When chicken has cooled, cut it into small cubes. In the same pan, now over medium heat, melt the butter. Add the onion and cook, stirring frequently, until it begins to caramelize — about 5 minutes. Add the flour, continue stirring, then add the celery, potatoes, peas and carrots. Cook, stirring, for 2 minutes. Add chicken broth, chicken cubes and cream. Cook for 10 minutes, stirring regularly. Sauce should be thickening to about the consistency of pancake batter — if it’s too thin, add a tablespoon more of flour, stirring in. (And continue adding as needed.) When sauce is desired thickness, remove from heat and stir in cheese, thyme and truffle oil (or truffle salt). Season to taste with salt and pepper, and let cool to room temperature. In a 9″ to 10″ pie pan, lay down a pie crust dough. Fill with chicken filling. Cover top with second pie crust dough, crimping around edges and using any extra dough to cover up holes. Bake for 30 to 40 minutes, until crust is golden brown and flaky. Remove from oven and let cool for 5 minutes before cutting into wedges and serving. You are so tolerant. If one of my kids said something I’d labored over for dinner was disgusting they would have been invited out of the kitchen and told they could come back later and make themselves a peanut butter sandwich. But I was raised by a Brit. Yes, mom, Sean is one of the most patient parent I’ve ever seen. Dude, the pot pie looks awesome and Steve loves pot pie so I can’t wait to make it!! Show me a parent who is always patient and I’ll show you a deaf and blind person. Leslie was hypothesizing that we actually need children to break our spirits or else we wind up with unfortunate afflictions like certain of both our siblings. It’s SO cold here and I am in such need of creamy comfort food that I would cut someone for a bite of that!